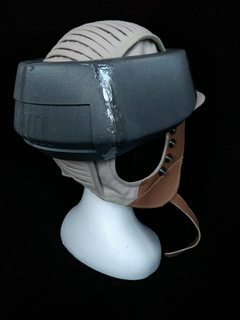 Rebel Legion :: View topic - Endor trooper - Helmet wip help! 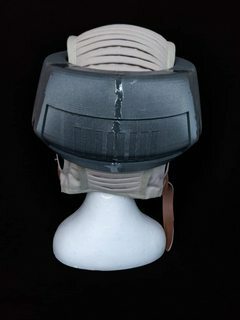 Posted: Thu Jan 31, 2019 8:39 pm Post subject: Endor trooper - Helmet wip help! 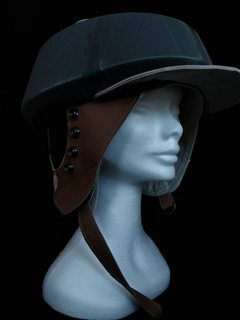 I wouldn't say that soft helmet is exactly 100% correct, but I don't know that the small variances would prevent approval. Obviously the donut needs more sanding and smoothing, and paint. What specifically are you concerned about? - Isn't the leather part too much extended? - Is it correct/approvable the ribbed part extended in the rear? - Has the donut the correct shape or is it too "bold"/"high" in the mid rear? 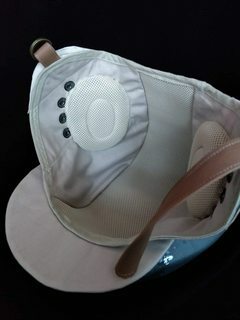 - Is the visor too big? 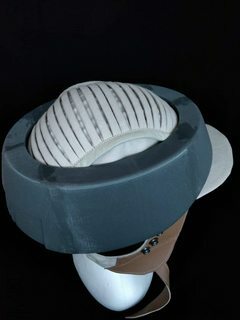 Is it better to unsew it from the soft part and screw it to the donut? It's an important part of the costume, and I don't want to do mistakes with it! 1) Is it 100% perfectly screen-accurate? 2) Is it approvable, even if not 100% screen accurate? The answer is, no, it's not perfect. There are definitely differences comparing to the screen-used assets. As to approvable or not, though, frankly I would *guess* that it's approvable, but I can't say for sure, only a judge can. JUDGES: CAN YOU WEIGH IN, IF SOMEONE IS READING THIS THREAD? 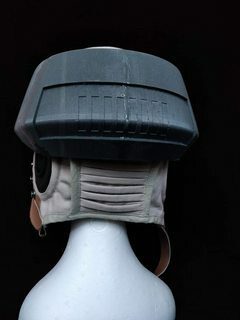 Again, I think the basic shape of the soft helmet is in the right ballpark, although it's definitely not exact. I suspect it is close enough to be approvable. 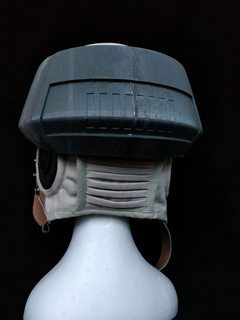 I base my guess on the many varied hand-made copies I have seen posted here (copies of the actual AN-H-15 soft helmets that were modified for the on-screen versions), which have been approved, even though they're not perfect matches. There are also usually a couple up for sale on eBay at any given time that may have good photos included, for more photo references. 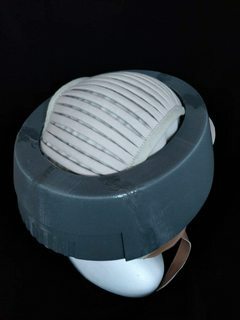 The ribbed top itself, for the screen-used helmets, was actually attached to the donut / ring, not directly to the soft helmet. But both options tend to be approvable. I point this out, however, to note that the ribbed portion should definitely NOT extend down below the back of the donut. That's the part that worries me the most, as far as approvability is concerned. But again, only a judge can let you know for sure whether they'd be ok with it. The brim itself almost certainly falls into the "close enough" territory. 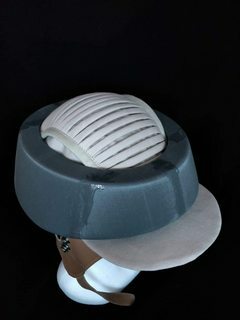 Again, for screen used helmets, I believe the brim was actually attached to the donut, and not the soft helmet. But when worn, it's nearly impossible to tell the difference, and both ways are definitely approvable. Size-wise, it looks like it's in the right ballpark to me, so I wouldn't worry about that. 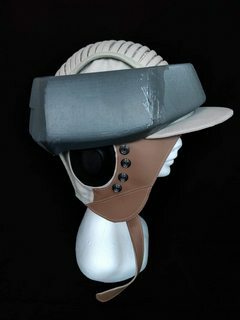 The earcups themselves look pretty good. I don't think you have anything to worry about, there. That said: Have you actually tried this on yet? 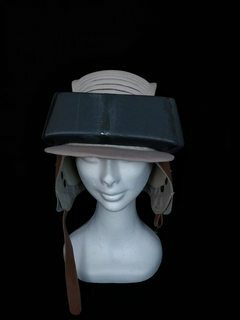 Are these your photos of YOUR helmet, or stock photos from the vendor? I ask because those ear cups look a little low to me. Are they actually over your ears? If so, no worries. Might just be the way it's sitting on the foam head. But it looks a bit low to me. As for the donut itself, IMO it's in the right ballpark. I think I'd agree it comes down a little low, in the back, particularly the part that appears to extend about an inch down from the indentation rows along the back? BUT I suspect it's close enough to being in the right ballpark that it would not be denied. AGAIN: Only a judge can say for sure, but that's my take on it. Based on the other varied donuts I've seen approved, I think this donut is close enough that it would likely be approved as well. I'd say sand the seams on the donut and paint, then it should be good to go! There you go. As I suspected, approvable. (once finished, of course). 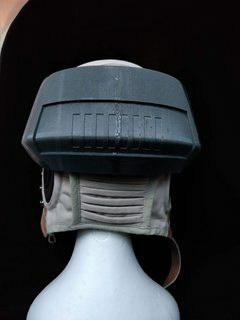 -These are pics of my wip helmet, all handmade by a friend and member of Italian Base; he used as reference the pictures found in the book "Star Wars - Costumes - The original Trilogy" (Brandon Alinger). 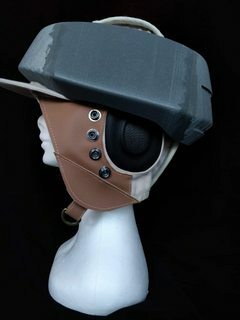 -The helmet is very comfortable, it sits perfectly on my head and the earcups are perfectly centered on my ears. 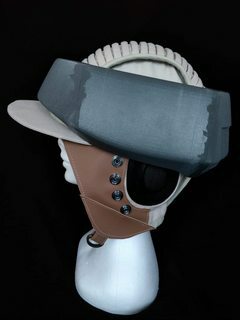 At this time the leather part has been modified following the book I mentioned above. Looking at the helmet on my head, I feel happy with the proportions of the donut...the pics I've posted didn't look like that. Jim Thatcher, who posted above, is a costume judge. So I wouldn't worry about it. No, it's not really accurate, but if the judge says he'd approve it, I think you're in good shape. Yesterday I started to paint the donut, but the color I prepared was totally wrong, I need to replace. Just eyeball the symbol. As long as you're in the right ball park, it should be fine. I usually just print off a few different sizes from photoshop, onto paper, and cut them out with scissors and hold them on the ring until I see the one that looks right. Measure it, and there you go. ...I did as you told me, it just worked fine! 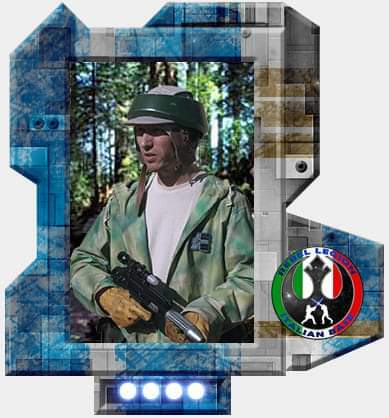 Today, I'm happy to say my costume has been finally approved!! Thank you for your support friends, I really appreciate! Yeah, I'll spread panic among imperial troops!!! Woo! Congrats! I have been following your progress but not posting bc kman had you covered. Well done!